The Russian contribution to conflict in Syria is not limited to air power. There are indications that Russian military personnel is taking part in fighting on the ground. These tanks are used by the Russian Armed Forces and were not exported to Syria. The German magazine ‘Der Spiegel’ claims in its latest edition that 2’000 Russian soldiers are stationed in Syria, including ground forces and artillery. The report concludes that the Russian military campaign is not limited to the bases around Tartus and Latakia. Traces of Russian soldiers on social networks indicate Russian involvement in Homs, Hama and Aleppo. On Nov 7, the Syrian news agency ‘Sana’ published a video of fightings in the east of Homs. 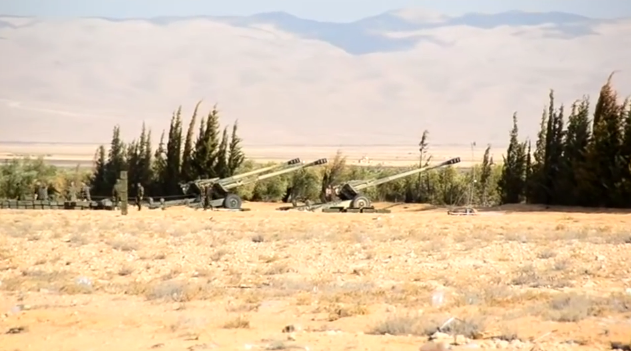 The footage shows several howitzers (Msta-B, 152 mm) in action. The men who operated the artillery were dressed in clothes that look like tropical uniforms of the Russian army. Moscow (unintentionally) confirmed the existence of its artillery around in Syria. In a briefing of the general staff the monitors in the background showed a map of the frontline indicating a Msta-B battery around Homs. The unit belongs to the 120th artillery brigade which is supposed to be in Siberia. 11/28/2015 Russia, Syria / Homs, Msta-B, Russian involvement in Syria, Syria, T-90. It is the time to armed and equipted the FSAs and Islamists factions in Syria with high-grade and high-tech weapons , including modern anti-air missiles . Why is this really surprising? The legitimate regime in Syria asked for Russia’s support, and even if you don’t think they are legitimate, the majority of the world and UN still does.